Not only is seafood really healthy, but it is so easy and quick to cook too, making it the perfect week night meal that can be ready in 15 minutes. 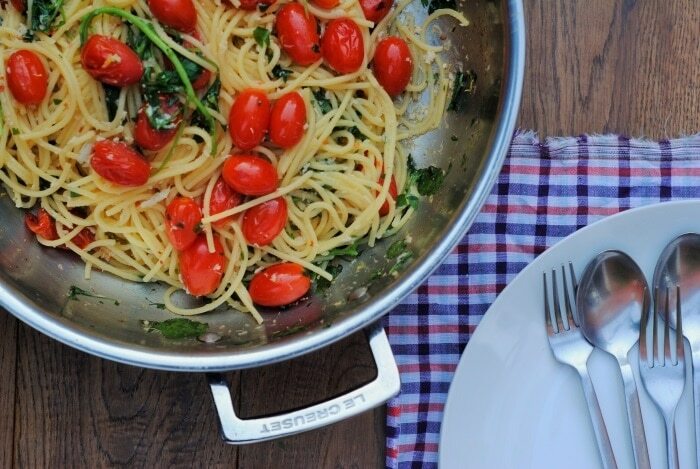 Add it to pasta and you have yourself a comforting meal in a flash. It is National Seafood Week and I am here to share with you all the wonderful benefits of seafood, as well as some new ways to use it. I have another delicious seafood recipes to share with you on Wednesday too, so look out for that! You can see lots of other seafood recipes over on Fish The Dish too. National Seafood Week 2015 (9th – 16th October 2015) aims to encourage people to buy, taste and cook seafood more often, as I think people are often scared to cook with it because they think it is difficult, but it is far from it. I have lots more seafood recipes to share with you soon, but this one had to be the first as it was a big hit in our house and only takes 15 minutes, which is quicker and cheaper than ordering a takeaway. Seafood is a big part of our diet as it is packed full of vitamins and minerals and omega-3 fatty acids that are essential for a healthy heart. I also find that the fish oil is really good for my hair, skin and nails and my hair has never been so shiny and soft. One of the things I love about this meal is that it is really light, but still quite hearty and comforting, which is ideal for this time of year as the temperature is dropping. It has a healthy amount of garlic in it too, which is essential for keeping me healthy and my immune system boosted. So, expect to see lots more recipes containing garlic and ginger over the coming weeks, as I am determined not to get ill again this cold season. You don’t have to use watercress in this. You could just as easily use kale (I know, I am kale obsessed) or any other greens that are cheap in the supermarket or that you have hanging around in the fridge. I never used to be a massive fan of cooking with wine, as I thought it was a waste of wine when I could just be drinking it, but a little bit adds so much flavour and it compliments the crab perfectly. 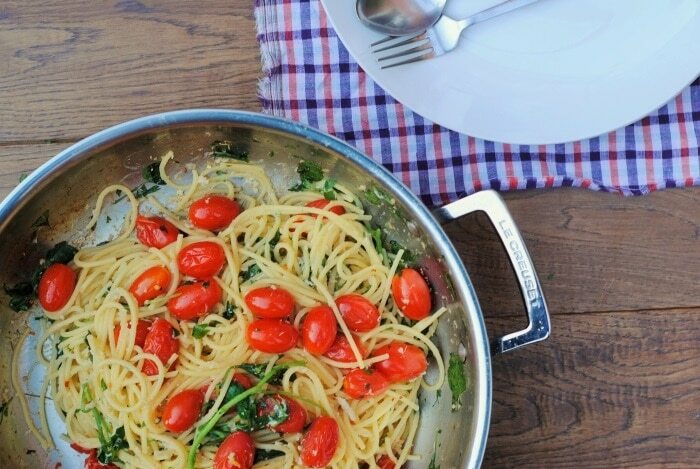 Not only is this Crab Spaghetti really healthy, but it is so easy and quick to cook too, making it the perfect week night meal that can be ready in 15 minutes. Add the oil to another pan and add the shallots and garlic and gently cook for 2 minutes. Add the wine and simmer for 3 minutes. Drain the spaghetti and add to the shallots with all of the rest of the ingredients and cook for 3 minutes and serve. **This recipe was commissioned by National Seafood Week, but all opinions are my own**. 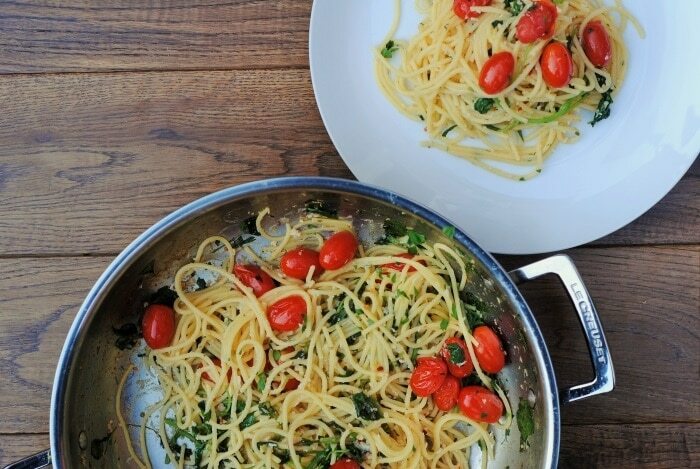 anyway , I thought I wld make the crab pasta …..tomorrow (today ) I hv read and studied the pics of finished dish and I am wondering do we really need to hv 250 ml white wine???? for 4 people it would be 500 ml …. (was always good at maths!!!!!!!) and yet the finished dishes don’t look as if they are swimming in wine, but 3 mins final cooking would not reduce the wine very much, or would it? It really is, isn’t it. Great to have in your cupboard to whip up a quick and healthy meal. This looks really simple and really really really really tasty! I was not aware it was National seafood week – but – I’ll take any excuse to eat more seafood – especially crab! Love your combo of it with watercress – don’t think I’ve tried them together before. Give them a try – a delicious combo. 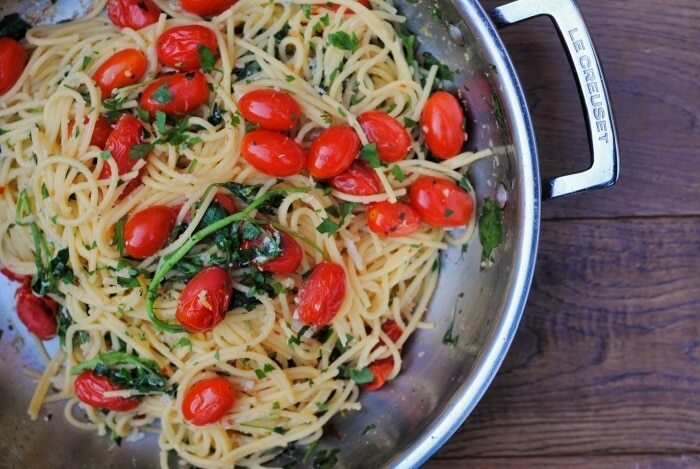 This crab spaghetti looks fantastic! Did not know it was national seafood week 🙂 Pinning of course! What a different thing to put in a pasta dish – I would never have thought to use crab. Sounds really impressive and posh! Try it in tacos too. So good! This looks so fresh and delicious – there are so many great flavours and ingredients in this! Such a yummy pasta dish, Dannii! I adore seafood and now tht we live by the sea we are blessed with super fresh fish. I’ve never tried crab though and must change that! This looks really lovely and so simple to make. Make the most of it now you are living near the sea! 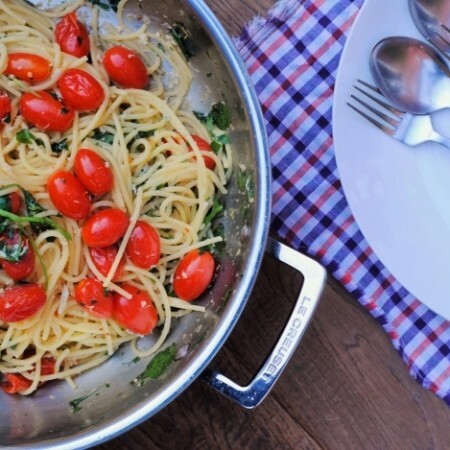 This looks like such a great quick dinner idea, love the freshness and colors here…plus anything pasta? I’m totally game! This time of year is ALL about the comforting pasta dishes. This looks so quick and easy – I love pasta sauces that can be made in the time it takes to cook the pasta! 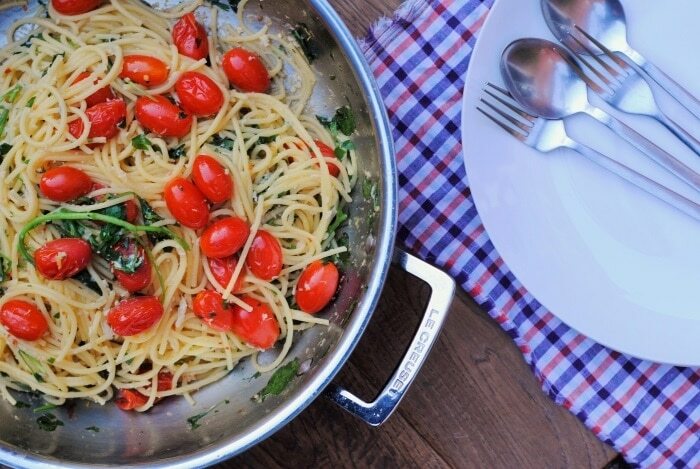 That’s the best thing about pasta I think – it’s so quick and easy. I love tinned seafood. Pasta with crab meat is always so delicious. It’s a great staple to have in the cupboard, isn’t it. I know, seafood is so good for you! I need to indulge more. I love this ingredient list. Never thought to pair tomatoes with seafood in the past, just not something I’ve done but eager to try. And I love the watercress in here, how unique Dannii! Thanks Laura. Prawns and tomatoes go really well together too. Oh that looks delicious! I love how quick it is to make as well. I’m not a big sea food fan but my mum is so I might whip this up for her as a treat.